The goal of Baptist Health Spine Center in Little Rock, Arkansas is to improve the way back and neck pain is treated for those in Arkansas. 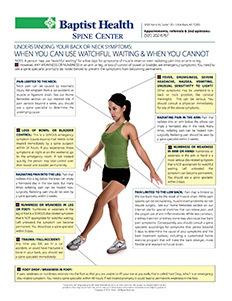 The problem is that most spine care is biased based on the specialty treating the patient. 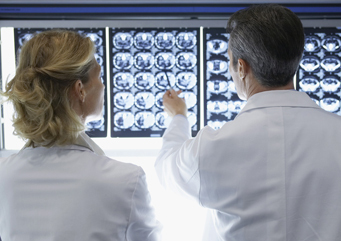 The solution is a multi-disciplinary team approach to spine care. By combining physicians who specialize in non-surgical treatment options, diagnostics, a physical therapy exercise gym and spine surgeons — all under one roof — the patient no longer has to drive around town to multiple locations for the best possible care for back or neck pain. Now isn’t that a welcome relief? For the person with back and neck pain, the journey through treatment can be agonizing. The patient often has to travel to one office for a physician visit, to another office for X-ray, then to another office for therapy, etc. If they are referred to outside specialists for non-surgical treatment options — such as a spinal injection — the patient often has to explain again their symptoms and medical history to a new physician. All of this fragmentation prolongs the treatment process, creates duplication of effort, increases healthcare costs — and frustrates the person who is already suffering from back or neck pain. Baptist Health Spine Center in Little Rock, Arkansas assembles under one roof the expertise of four spine neurosurgeons; one non-surgical spine physician who specializes in non-surgical treatment options and spinal injections; a team of spine therapists working in an exercise gym; an internal injection suite; and a diagnostic center with X-ray and MRI all within the same building. The facility — located near the main Baptist Health campus in on the west side of Little Rock — combines all the necessary aspects of spine care under one roof so the back or neck pain sufferer no longer has to drive around town to multiple locations for doctor visits, diagnostics and therapy. Communication is also enhanced because the patient has one central medical record that all the providers can access, so the patient no longer has to repeat themselves to a series of fragmented physicians and therapists. 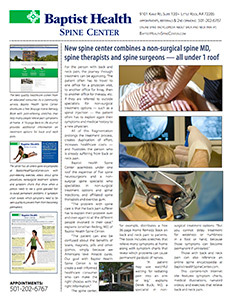 “The problem with spine care is that the back pain sufferer is bounced from a primary care provider to another location with a pain specialist to a third location for therapy and then a spine surgeon,” explains Gautam Gandhi, MD, a spine specialist at Baptist Health Spine Center in Little Rock, Arkansas. "In the process, the back pain sufferer has to explain their problem over and over again to all the different people involved in their case. We combine the spine team in one location so the person doesn’t have to drive around town anymore."